We recently launched the beta of our Angular2 components for Onsen UI. Angular2 is a brand new framework and people are just starting to get familiar with it. We have decided to start a series of articles to help people get started with the framework. This article is the first in the series and will explain the very basics such as how to set up the environment and how to create and run a simple app. We will be using the newly released Angular2 CLI tool since it makes it very easy to get started without having to fiddle with things like Webpack and setting up the testing environment and linting. The current app is very simple, all you can do right now is see pictures of all the Pokémon and what their name and number is. We will expand this app in a later article to add more features such as routing and searching. The source code for the app is available on GitHub. In this article we will be using Angular RC5, which is the latest release candidate. It was released just over a week ago but there are some important changes such as the addition of the NgModule decorator. TypeScript also makes it possible to import objects from other files which helps when structuring your code. The first thing we need to do before getting started coding is to install the Angular2 CLI. To be able to install it you first need to make sure that you have NodeJS installed. If you haven’t installed it already you can find instructions here. NOTE: The version number is important since the version you get by default is not compatible with Angular2 RC5 which was released just a week ago. I will update the article when a new stable version has been released. I recommend that you always keep the development server and the browser window open while developing since it will automatically rebuild your project every time you change the source files. The CLI tool has commands for scaffolding. This makes it possible to add things like new components, routes or services from the command line. People who have worked with frameworks such as Ruby on Rails or Ember will be familiar with this. To use scaffolding the ng generate or ng g command is used. Some of the things that can be added with scaffolding are components, routes, services, classes and pipes. Apart from speeding up development, scaffolding will also enforce a strict project structure. This helps when collaborating with other developers and makes it easier to navigate projects written by other people. A service is an object that can be shared among all your components. It is often used to fetch and store data. In our app, we will create a service that fetches data from the Pokémon API. As you can see it not only creates the service but also a spec file for it where we can put our tests. For now, let’s ignore the spec file, we will talk about testing in a later article. 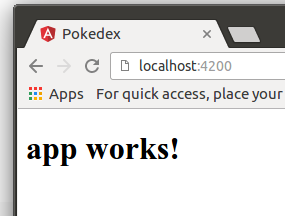 The service can now be accessed by using this.pokedexService in the class methods. In the app.module.ts I also added code to import the HttpModule and add it in the imports field which gives us access to the HTTP service that Angular2 provides. We will use this in the Pokedex service to fetch data from the API. We now have a service that we can use in our main app component. Instead of using generic objects to describe our data we can create a Pokemon class. By doing this we can define the types of the fields. This is very useful since it gives us code completion so we don’t have to memorize the structure of our data as well as helping us catch bugs. You can use the CLI to create a new component with the ng g component command. However, in this app, we will only use one component and the root component has already been created for us when we ran the ng new command. We will take a look at how to compose multiple components in the next article. A component in Angular2 generally consists of an HTML template that describes how it will be rendered as well as a class that contains the business logic. It is important to include a hyphen in the tag name since HTML5 doesn’t allow custom tags without hyphens. This is to avoid collision with native HTML elements. The templateUrl parameter is used to load an external template. For simple components, you can define the template inline using the template parameter. Stylesheets are loaded in the same way using the styleUrls parameter. In the implementation above we define a method called ngOnInit. This is a lifecycle method that will automatically run when the component is first created. We use it to load the initial data by calling the loadMore() method. The implementation of the loadMore() method is pretty straightforward. It will load the next 9 Pokémon from the API as well as setting the imageLoaded field to false. This is just to be able to create a fade effect when the image has been loaded to avoid flickering. If you are familiar with AngularJS 1.x you might think that the code above is a bit strange since we append the new data inside an asynchronous callback. In the previous version of AngularJS you would need to use something like $scope.evalAsync or $scope.$apply to trigger a new digest loop to rerender the view. Angular2 is using a technique called Zones which makes it possible to hook into and detect changes inside asynchronous operations so the view will be rerendered automatically. This is a welcome change for a lot of Angular developers since having to manually trigger the digest loop was a source of a lot of frustration. In Angular2 templates we use something called directives to render our data. To conditionally display an element the ngIf directive is used. In the template above we also use the ngClass directive to hide the image until it has been completely loaded. In our template, we listen for the load event of the <img> tag so we can toggle the imageLoaded property. It will also automatically include the pipe in your app.module.ts file so there is no need to manually edit it. We have now completed our very simple app. As mentioned earlier we will keep adding content about Angular2 in the coming weeks. We will explore concepts such as components, services and routing in more depth in other articles. If there is anything in particular you are interested in, please let us know in the comments below.